We are glad to see you at AllTrainersPC.com! If you want to download Far Cry 5 Trainer for free, you can do it right on this page! 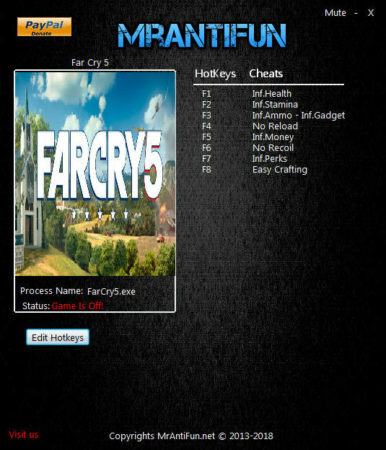 This cheat works on the game version 1.013 and above. Trainer includes 9 useful functions, using which you can get a big advantage in the game. Far Cry 5 is a shooter from Ubisoft, following up from Far Cry Primal where you walloped prehistoric wildlife. 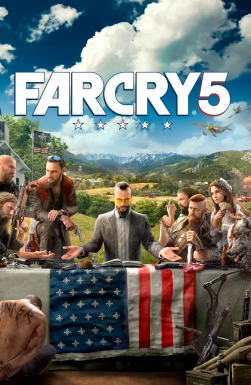 Far Cry 5 now allows you to make your own custom character and places you in the exotic setting of the American midwest, then asks you take on a group of challenging enemies. For perks cheat you have to use the Perks at least once after activating cheat to get its effect. V109 is out. How about an update? Thanks.